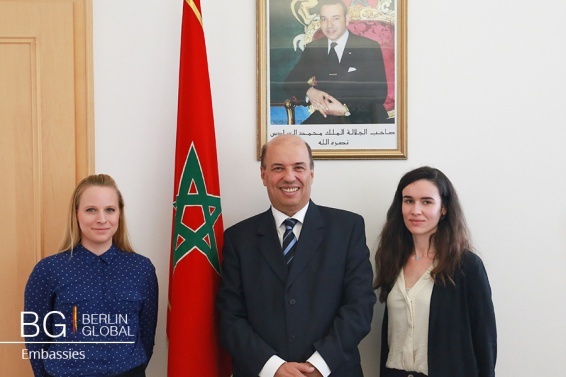 On 17th August 2016, a team from the ICD had the pleasure and privilege of interviewing His Excellency Omar Zniber, Ambassador of the Kingdom of Morocco to the Federal Republic of Germany. This interview allowed to us gain a deeper insight into the nature of German -Moroccan relations as well as the Embassy’s work to promote Moroccan culture in Berlin and throughout Germany. Ambassador Zniber shared with us his vision of cultural diplomacy. The interview began with an overview of the Ambassador’s career. From an early age, His Excellency Zniber has been an avid reader of books and newspapers on history and international politics. Part of his motivation to become a diplomat stems from his desire to understand the complexities that arise from the political world. The evolution of Morocco from a protectorate to an independent kingdom and the ensuing National Independence Movement, in which his father was personally involved, further strengthened his conviction to become a diplomat. According to His Excellency, “being a diplomat also means being one of those who defends the interests of the country”. “Culture is what remains when all is forgotten”. Quoting French writer and ex-Minister of Culture, André Malraux, His Excellency Zniber discussed with us the fundamental importance of cultural diplomacy. “Cultural diplomacy is very simple – it is the strengthening of the relationship between two countries”. According to His Excellency, “everything that relates to culture is fundamental in one capacity to understand, dialogue with and respect the other”. In a world where diverging interests and differences between states and peoples have often given rise to confrontations and misunderstandings, the Ambassador is convinced that “culture must create bridges for people to understand each other and co-exist peacefully”. Located at the geographical crossroads between Europe, Africa and the Maghreb region, Morocco has a historical tradition of diversity and tolerance. The Ambassador stressed the “enrichment from the influences of various populations from across and beyond the Mediterranean that constitute Morocco”. Thus, “cultural diplomacy is an important vector, that all Moroccans – not only diplomats – experience in their identity and daily lives”. The Ambassador shared with us his own vision of cultural diplomacy and how it guides the Moroccan promotion of culture here in Berlin. To promote Moroccan culture in Germany, the Embassy strives to present Morocco in all its cultural diversity, particularly the diversity of its population – ranging from Amazigh and Arabs to Jews. This mosaic of cultures is reflected in Moroccan artistic productions such as theatre, dance, art and cinema. For His Excellency, the participation of Germany’s Moroccan diaspora in the Embassy’s cultural events is essential. Germany boasts a 180,000 strong Moroccan community which has been developing since the 1960s. One notable event in the German–Moroccan cultural agenda is the annual ‘Moroccan Week’, in which various Moroccan artists, musicians, filmmakers and dancers living in Germany are invited to showcase their talent. Another initiative was the organisation of a ‘Book Caravan’, which brought Moroccan literature and a photo exhibition about the German presence in the country in the late 19th century, around Germany. The Ambassador believes that “diaspora participation in cultural events, conferences and debates is crucial because by sharing their experiences they contribute to diffusion of Moroccan culture and lifestyle across the country”. This is part of the dialogue that builds bridges between nations. According to Ambassador Zniber, “Morocco is a fundamental interlocutor for Germany in the Mediterranean”. “As the country boasting the strongest partnership with Europe”, Ambassador Zniber is adamant that dialogue intensifies cooperation between Morocco and Europe. German and Moroccan cooperation has already yielded fruitful results, particularly in the fields of energy, agriculture and environmental protection. Morocco and Germany have a strategic partnership in the development of renewable energies which can be seen in the recent opening of the Ouarzazate Solar Power Complex in Southern Morocco. German expertise and investment have been essential in the field of sanitation and water management in a country like Morocco, which has a semi-arid climate. Alongside technological transfer comes the exchange of knowledge and expertise which contributes to furthering understanding and collaboration. The opening of Morocco’s industrial sector – notably car manufacturing and logistics – has attracted numerous German investors and has resulted in many collaborations, such as the establishment of a German operator in the port of Tangiers. However, the Ambassador noted that educational cooperation was still lagging: “we would like to strengthen our relations with Germany through academic exchanges and collaborations between German and Moroccan universities and research institutes”. Furthermore, Germany’s role as Europe’s economic and political powerhouse appeals to Morocco, with whom it seeks a strong partnership in order to establish a common vision of the future of German-Moroccan relations as well as wider European-Mediterranean relations. In conclusion, H.E. Zniber shared with us some valuable words of advice and encouragement for aspiring diplomats. “You must be motivated: diplomacy is a career that cannot be chosen by obligation”. According to His Excellency, “what distinguishes graduates with the same intellectual background from one another is motivation”. Furthermore, “diplomacy is a challenging career, requiring one to be open-minded, to have a strong command of numerous languages and of course to use culture as a tool to reduce the tensions felt around the world today”. For His Excellency, a diplomat is also someone who is ‘’convinced that he works for peace”. Noting his own personal experience, the Ambassador shared with us that, “[my] work, at a modest and humble level, contributes towards an effort to bring about peace across the world”. Diplomats have often and wrongly been amalgamated with malicious and egoistic people seeking to achieve their own interests at all costs, however for Ambassador Zniber it is essential to ask oneself as a diplomat, “what have I done to contribute to creating peace in the world, even in the most modest way?”. Crucially, diplomats must “develop culture to participate in the reinforcement of peace”.